Check out what others have to say about their experience with TUCKERS DOODLES AND POODLES. Whether purchasing from our selection of Goldendoodle, Labradoodle, Standard Poodle and Golden Retriever puppies, customers have nothing but positive things to say about us. Read on to learn why we're their preferred dog breeder. "I cannot say enough about how much joy little Chloe has brought to our home. My children are absolutely thrilled, as is Chloe. She is making herself right at home. The first time I came to Country Girl Kennel, I was amazed how clean, sterile, and organized Debbie's facilities are. Each area was well thought out and extremely clean! Which is very important to me when purchasing a new member of our family. It is made very clear to any on looker that Debbie pours her heart and soul into her animals, whether it be the mom, dad, or the puppies. 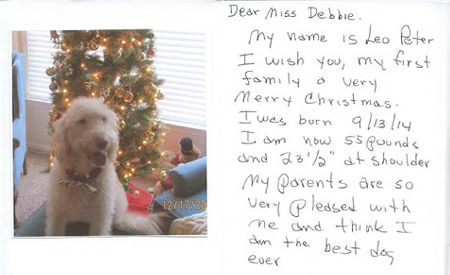 More importantly you can see how much the dogs love Debbie and Duane too!" "My name is Ashiki and I am a single mother of a 10-yr son and 5-yr old daughter. I struggled with the idea of getting a puppy but I always promised my children when I purchased a home that I would get them a puppy in about a year. Well, it's been over a year so I tried to adopt from two local agencies in Beaufort County and they turned me down after getting all in my personal life and business. I found Debbie in the newspaper and I haven't looked back since. Instead of adopting an animal that I didn't know if he/she would have any mental or medical issues, I got a puppy where I know everything that's 'not' wrong with him. He's a sweetheart! KayCee is lovable and loved by all in my family and my friends. Debbie made the process painless and I can call her at anytime to ask a question about my Merle Cocker Spaniel. Chloe, the puppy in the first testimonial, is one of his sisters. Thank you Debbie, my children are in heaven." "We just purchased a Pomeranian puppy from Country Girl Kennel. She is the sweetest puppy and very good natured. We are very pleased with our new baby." "Debbie, I worked on a Bichon yesterday, that you sold to a woman about 2-3 months ago. I can't believe the temperament of this little girl! She was SO SWEET....I'm amazed at how well your puppies behave. She sat for the entire groom and gave kisses through the whole process. Congratulations! In my eyes you are the 'Breeder of the Year'! It makes my job soo much easier when they are good. Thank You!"